Do you like the butterfly?! 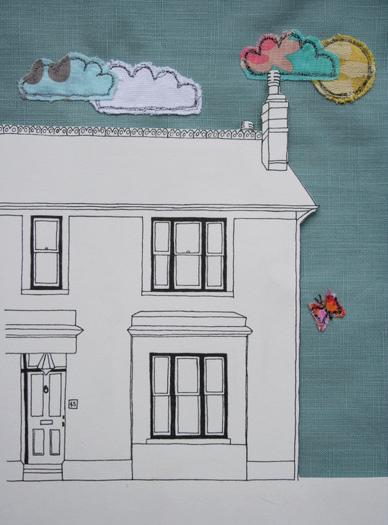 I had a go at embroidering the sky for one of my house pictures today as a bit of an experiment. Choosing the fabrics was fun and sewing them on wasn’t too bad, once I got the hang of it. I need to put it in a frame to get a better idea before I can say I’m entirely happy with it though. I must admit, sewing the clouds and sun onto the sky background was a bit strange as the needle had a mind of it’s own and straight lines are very difficult, but then clouds aren’t supposed to be nice and neat, so that’s okay (am I rambling?) What I’m trying to say is it was quite hard for a perfectionist, but I think the experience (!) was good for me too. Make a lampshade, drink tea and eat cake! I think it looks brilliant – really different.